Since 2012 we have invited our cooperation partners as well as other interested schools to an annual network meeting. Here, we coordinate our activities and journeys and we also include our Tanzanian partners. 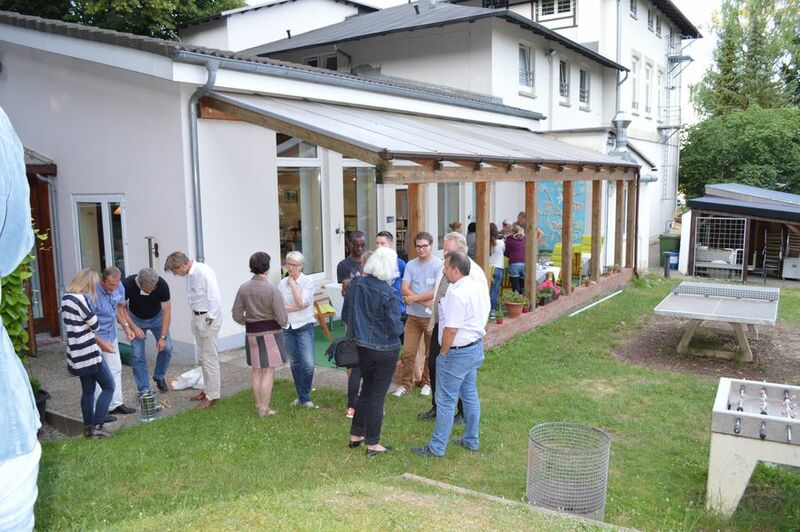 The fifth RAFIKI network meeting took place in Kellinghusen on 6 July 2015. First of all there was a general introduction about current developments at the KIUMAKO. The RAFIKI spokesman Oliver Zantow emphasized a big success last year: the governmental recognition of the KIUMAKO as Secondary School. Pracseda and Gilbert Towo from the KIUMAKO were welcomed as special guests. Gilbert Towo delivered greetings and was strongly encouraged about the big amount of young people in the RAFIKI network. Marcus Wack, who is responsible for volunteering at Rafiki e.V., provided information about the work of the current volunteers at KIUMAKO and in the partner projects. Apart from that two of the four new volunteers, Caroline Parr and Charlotte Masekowsky, were introduced. Furthermore some network partners presented their projects. In this context Anja Stenhüser from the Selma-Lagerlöf-Gemeinschaftsschule Ahrensburg reported on a charity runwhere students collected 6.232€ for the projects of RAFIKI in Tanzania. She also delivered the sum symbolically with a big cheque. Additionally Ellen and Klaus Karpen presented the new developments concerning the topic energy-saving stoves and their insights from the seminar at Artefact. They brought one oven as an object of study. Later on a successful BBQ took place using the oven. 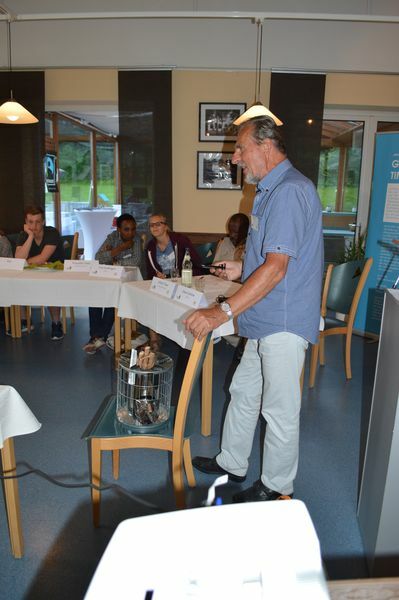 Besides, the employees of BiBeKu GmbH Annika Ehlers, Isabella Seider and Nadja Lackmann presented the FairTrade Trainers that they developed and that had aleady been handed over to three educational institutions within the network. Afterwards there was time for personal exchange and spry conversations between the network partners. During the time from 23 June to 6 July 2014 we hosted five Tanzanian guests: the head of the vocational centre KIUMO Fred Minja, the parish priest Yese Kimaro, our employee Pracseda Towo as well as the two young women Gloria Mero and Nancy Towo. Our guests have not only participated in our network meeting that included many of our network partners such as RBZ Wirtschaft . Kiel, RBZ Steinburg, GemS Am Himmelsbarg in Moorrege, GemS Am Lehmwohld in Itzehoe, Jugend im Ausland e.V., Beruflichen Schule Bad Oldesloe, GemS Ahrensburg, Hannah.Arendt-Schule Flensburg, BiBeKu GmbH, some RAFIKI-members as well as some students from the University of Kiel and that took place in Kellinghusen at BiBeKu GmbH, but also visited several of these schools during their visit: GemS Am Himmelsbarg in Moorrege, GemS Am Lehmwohld in Itzehoe, RBZ Wirtschaft . Kiel and RBZ Steinburg. In Moorrege, Itzehoe and Kiel project days were organized that obtained an enormous authenticity due to the guests. With Fred Minja a speaker was available who came directly from Tanzania who is the head of an educational institution. Content-related he was just the man we had hoped for - a valuable dialogue partner. Language-related, it was first for the students hard to communicate in English. But after slight problems this worked well. But a teacher was also present all the time, so there was a translator if necessary. The second speaker was Pastor Yese Kimaro. 15 pupils of pre-vocational class KVJ 13a were divided into three groups and they focused on the everyday lives of young people in Tanzania with the Tanzanian guests. They dealt with the usual daily routine, leisure habits, education and vocational training by comparing the two countries. In addition to the speakers the students had also the opportunity to do research on the internet and to access the information of our exhibition about Tanzania. The tasks were formulated in German and in English, so that the Tanzanian guests were involved in the whole process. The pupils had the task to document their elaborations on a poster and to present them afterwards. So on the one hand the pupils learned in many ways, on the other hand the poster is a way to make the contents public at school, and so many people can be reached with this kind of information. On the third day the pupils have then opened their cafeteria, the "Café Kilimanjaro", which offers exclusively fair traded and organically produced goods. This was a first opportunity to present the posters to many visitors of the cafeteria. Apart from that the class took the opportunity to discuss issues concerning the growth of coffee at Kilimanjaro (and further questions). In addition, the guests have been actively involved in the preparation of the new volunteers as part of the "weltwärts" program; the preparation took place in Kiel. Also, our visitors could ensure an optimal preparation for the encounter journey in September / October with their school visits, attended by representatives of schools from Moorrege, Itzehoe and Kiel. They also participated in a partnership group meeting on RBZ Steinburg, where the cistern project has been evaluated. 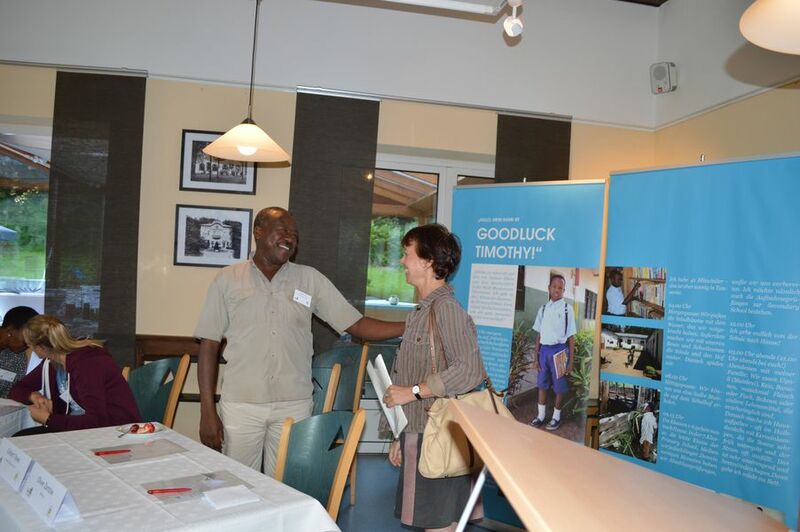 This short presentation shows very clearly how intense the partnership with the KIUMAKO Secondary School in Tanzania is anchored in the educational work in Schleswig-Holstein. Other schools have expressed an interest, such as the Berufliche Schule Bad Oldesloe. The Gemeinschaftsschule in Ahrensburg has decided to enter a partnership with the KIUMAKO School in their school conference.